Hearty Spaghetti Squash Boats loaded with sausage, cheese and flavor. Make as mild or as spicy as you like. All the flavor of traditional pasta without all the empty calories. Hello, Fall! We’ve missed you. From Slow Cooker Baked Apples to Pumpkin Doughnut Holes , we love everything that accompanies this season, including hearty recipes such as Spaghetti Squash Boats. 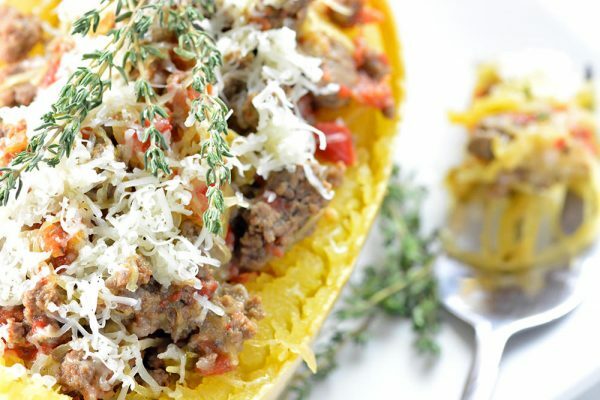 Our Spaghetti Squash Boat recipe is loaded with Sausage, Cheese and a variety of veggies and seasonings for a bold flavor. 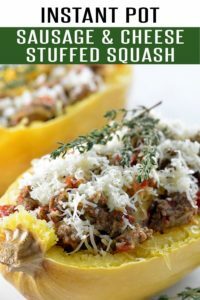 Thanks to our handy Instant Pot, Spaghetti Squash Boats recipes are easy to make and take a lot less effort than the traditional method of cooking squash. Our Instant Pot Spaghetti Squash Recipe is 100% made in the Instant Pot. No transferring to the oven or using three pots to “prep.” Nothing says “annoying” than an Instant Pot recipe that requires the use of the stove or oven. Hard pass on that. And before we forget, we utilized the popular Instant Pot Duo Plus for this Spaghetti Squash recipe. 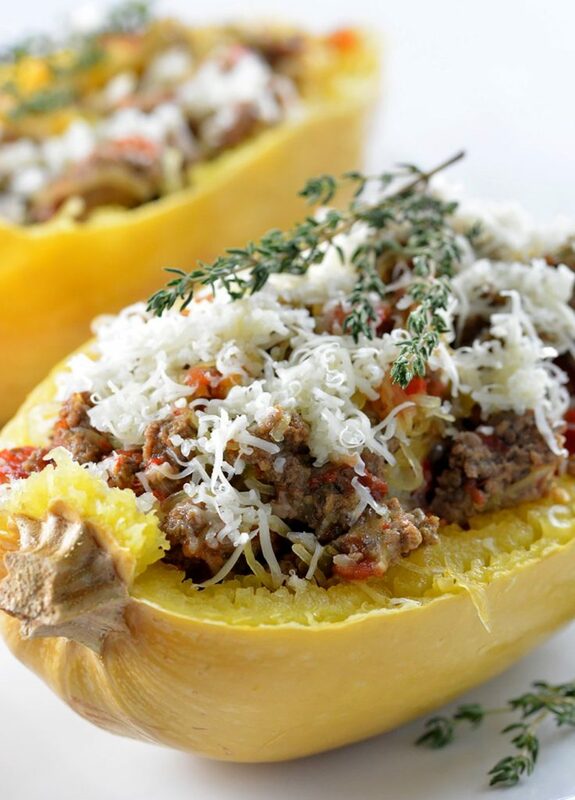 Spaghetti Squash Boats Paleo- omit the cheese to keep this a daily free and paleo friendly recipe. 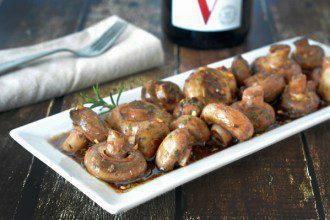 To make it even more paleo friendly, you can replace the turkey sausage with ground turkey. 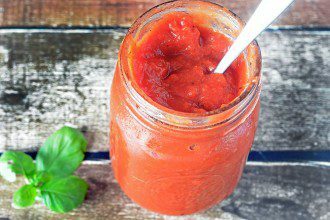 21 Day Fix Recipes – On the 21 Day Fix diet? Swap out the sausage with ground turkey. This will calculate to: 2 greens, 2 reds, 1 purple and 1 blue. Freeze it! The “stuffing” part of this recipe freezes extremely well. 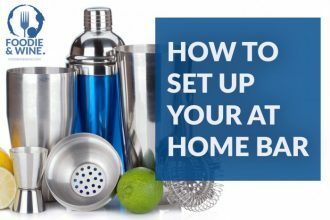 Perfect for those who meal prep or have leftovers. We LOVE spice here at Foodie and Wine. We double the red pepper flakes and use spicy turkey sausage for an extra kick. Don’t forget to pick up the Hot Rotel while you’re at it. With Fall underway Spaghetti Squash Boats will be on our menu plan at least once a week until we OD. Trust. There’s that good. Turn on the Instant Pot to the sauté setting and add the oil. Sauté the sausage with the onion, bell pepper, garlic, salt, pepper, Italian seasoning and red pepper flakes for about 3 minutes. Added the Rotel and stir until combined. Pierce the spaghetti squash and place on top of the sausage mixture. Turn the Instant Pot to the Pressure Cooker setting. Set at high pressure for 15 minutes. Let the pressure naturally release for 10 minutes. Remove the squash when it's cool enough to handle. 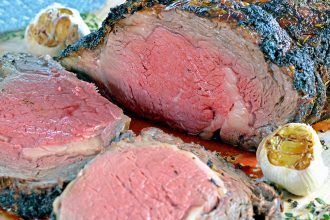 Cut lengthwise with a large knife. Scoop out the seeds leaving the strands in place. Transfer each half to a large plate and, using a slotted spoon, top evenly with the sausage mixture. Sprinkle shredded cheese over the top (to taste) and enjoy immediately. What size can of rotel? The 10oz can! My grocery store doesn’t sell anything larger so I didn’t realize they came in larger cans!